Changing the Picture – MP3 by Zig Ziglar – Discount! Proven steps to building a positive image of yourself from America’s leading authority on enhancing your self-esteem. In this life-changing seminar, Zig deals with the picture of yourself that we often call self-image and our attitude. Discover eight powerful steps to building a good self-image; identify and correct self-image problems by confronting them; become a responder rather than a reactor; and learn life-changing attitudes to building good relationships. Simply change your picture and you change every facet of your life. Zig discusses the importance of being a RESPONDER and not a REACTOR and how to know the difference. He also teaches you the eight steps to building a good self-image. He teaches you the importance of confronting your problems in this all-important area of self-image. He teaches you to recognize a poor self-image by identifying its manifestations. Finally, Zig reveals the ten steps to developing “Winning Relationships.” Included is a discussion of what people want and expect from others in family, employee and employer situations. He explains why “golden rule” companies grow faster, make more money and give a greater return on equity than other companies. 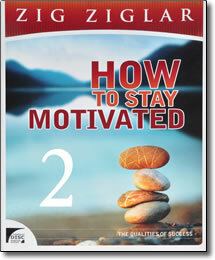 Changing the Picture is Volume II of the How to Stay Motivated series, which is available as a set on audio CD.